Now that I have my Duet Ethernet setup and programmed, now is the time to get everything printing properly. Please take a look at the attached pics of this part (fan holder) and tell me where I need to look to fix these printing fails. Thanks! Click for more pictures here. Looks like insufficient part cooling and insufficient retraction, possibly printing too hot. That looks really terrible. For me it seems that there are mechanical issues as well as Configuration-Settings from the Slicer and also wrong temperature used. Maybe you can tell us what kind of Material (PLA, ABS, PETG, Nylon,…) u r using and also which slicer and what configurations and temperatures. Wow, my bad. Taulman 910 @ 260º and bed at 45º. Bed is borosilicate glass with a thin coating of Elmer's Glue-All. Slicer is Simplify3D 4.0.0. Temps are based on what Taulman told me via support email. Printer is an i3 variant with an E3D Titan Aero extruder with Volcano hot end; .4mm nozzle. Board is a Duet Ethernet 1.0 running 1.19.2 firmware. Ah, i've thought that this was Nylon but it's better as you confirmed it. Alloy 910 is normally easy to print and you've no issues with the Layer Adhesion at all. It seems that either your Speed (Travel, Retraction, …) are to fast for that mechanic cause i can see shifting. 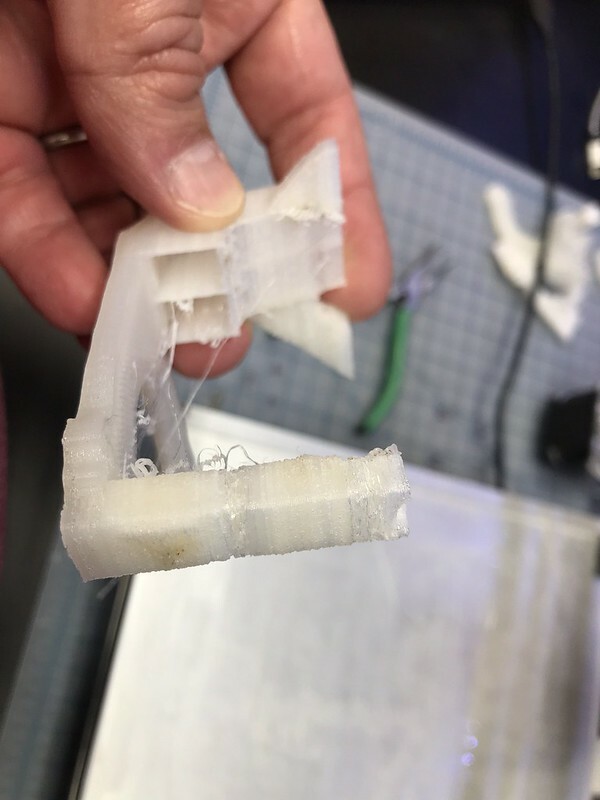 Have you tried to print a calibration cube before? Maybe also export your FFF-Profile and share it. 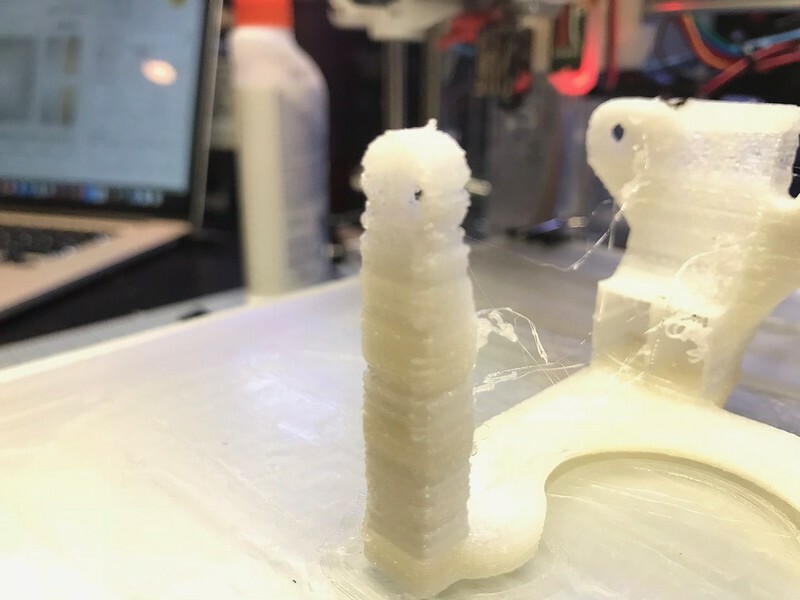 Have you tried calibrating the extruder? What are you steps/min set to? Here is my FFF file. I also started the print again dropping speed from 58mm/s to 40mm/s and it already looks better. The holes still could use to rounder/clearer. Did you proof if espacially your Extruder Motor really need 1400 mA of current? That seems very high for me. Additional i assume that you not need to set the Extrusion Multiplier to 1 cause for me it loóks as you have calibrated the steps correctly. According to the specs from E3D, their Titan Extruder motor has a rated current per phase of 1.4A. Drop it to 855mA and look what happens. Raise the Current only if you are notice mssing steps or if the torque is not enough. How long is your bowden Setup? If this is a direct drive i'm wondering why you use 5mm retract in your configuration. In my Bowden-Setup with ED6 Chimera (aboutr 60cm each) i'm only using 1.20mm. But the questions in regards to "calibration" of Steps are still not answered. 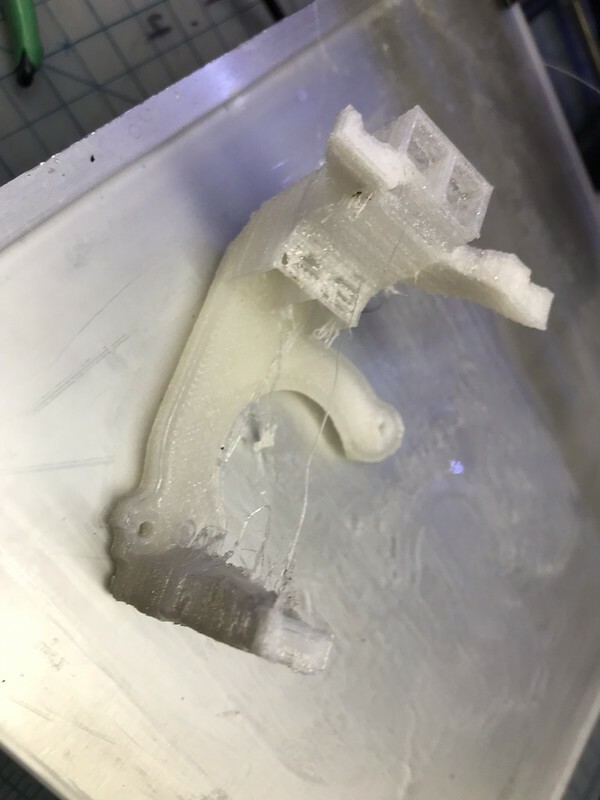 Have you tried to print it in PLA or PETG instead to proof the Settings and Mechanics are working and maybe only the Filament is bad? I stopped the print. It's a bit better w/ the slower speed. One thing is that for several layers, it wan't extruding properly. I ran a 20mm cube. It came to X: 20.3, Y: 20.19, Z: 19.75. Not too shabby. That does not indicate anything, cause "dimensions" impacts Steps of Axes and also Steps of the Extruder combined with Extrusion-Width. Therefore again: Have you ever calibrated your E-Steps/mm and have you tried to print the same with a different material? I calibrated my extruder; marked off 120mm, extruded 100mm, and adjusted accordingly. As for printing in another material, that's why I'm printing the fan holder for my extruder. I also have some Taulman n-vent and In-PLA, but I believe both require a fan. Does NinjaFlex require a fan? I have no part Fan currently and still be able to print most every thing without any issues. Okay, stringing will happen for sure and sometimes not a perfect finish. But never so "ugly" as yours. Why thanks. Any other suggestions?